Organising a special wedding anniversary? Weather it's your 1st, 25th or 50th anniversary, design your perfect invitation and make sure nobody forgets the date! 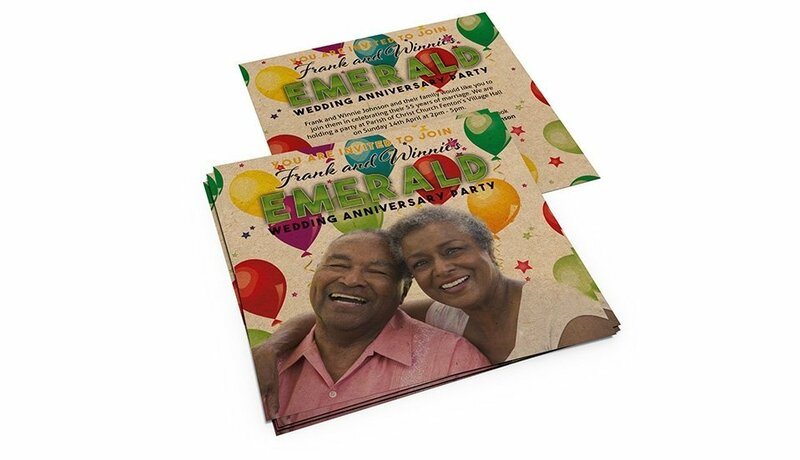 Gather all the people you love together to help you celebrate with invitations printed and delivered by StressFreePrint. Silver, pearl, ruby, gold or diamond - every wedding anniversary should be memorable and this year is no exception. Whatever the theme, send us your own artwork using our handy file uploader or we can create it for you... and don't forget to complete the look with matching envelopes. Make sure your anniversary party is one to remember - share the love with a perfect invitation to mark this very special day. Order yours today.